One of greatest minds the world has ever known has died leaving behind some disturbing predictions about climate change. British professor Stephen Hawkings warned, "we are close to the tipping point where global warming becomes irreversible". Hawkings was a ground breaking theoretical physicist, often described as the world's smartest man. He contributed to our understanding of space and time but he is best known for his finding that black holes are not entirely black. He succumbed to complications from the motor neuron disease ALS on March 14th at the age of 76. Towards the end of 2016, Hawkings said that humanity's reign on Earth will come to an end due to man-made mass extinction. He spoke about the need to colonize space. "We must also continue to go into space for the future of humanity," he said. "I don’t think we will survive another 1000 without escaping beyond our fragile planet." Hawkings cited threats to our survival including nuclear war, man-made viruses, and AI. He also said that "catastrophic global warming" represents a very grave threat to the survival of life on Earth. Right up until the end of his life Hawkings warned of the urgent need to halt global warming. 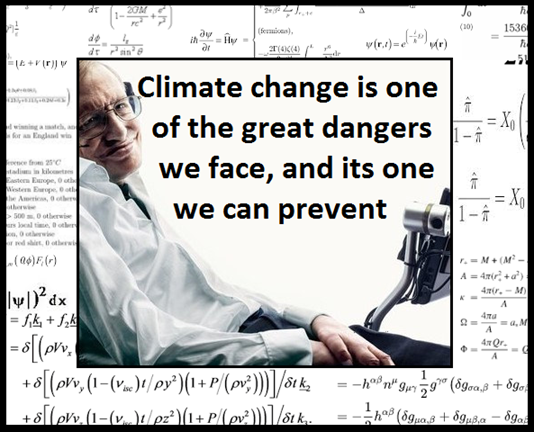 "Climate change is one of the great dangers we face, and it's one we can prevent," Hawkings said. Hawkings openly confronted Trump calling him a "demagogue". He decried Trump's authoritarianism and called him on his climate denial and his decision to withdraw from the Paris Climate Agreement. He said that he would like to, "ask him [Trump] to renounce his denial of climate change." "I am not denying the importance of fighting climate change and global warming, unlike Donald Trump, who may just have taken the most serious, and wrong, decision on climate change this world has seen," Hawking said. "By denying the evidence of climate change and pulling out of the Paris Agreement, Donald Trump will cause avoidable environmental damage to our beautiful planet endangering us and our children". At the beginning of 2018, Hawkings sharply rebuked climate deniers by telling them to take a trip to Venus, a planet ravaged by extreme heat. He pointed out that Venus was once a habitable planet but the build-up of greenhouse gases created the inhospitable climate we see today. "This is what happens when greenhouse gases are out of control", he said. "Next time you meet a climate-change denier, tell them to take a trip to Venus; I will pay the fare", he added. "Trump's action could push the Earth over the brink, to become like Venus, with a temperature of two hundred and fifty degrees, and raining sulphuric acid," Hawkings said. The Trump administration has been at the forefront of efforts to undermine science. Hawkins commented on the growth of anti-science sentiments and he suggested this may have serious consequences. "People distrust science because they don't understand how it works," Hawking said. "It seems as if we are now living in a time in which science and scientists are in danger of being held in low, and decreasing esteem. This could have serious consequences. I am not sure why this should be as our society is increasingly governed by science and technology, yet fewer young people seem to want to take up science as a career," Hawkings explained in a Wired interview. Despite the dire warning, Hawkings described himself as an "enormous optimist" adding the caveat that we must learn to work together. Hawkings called out Trump for his nativism and his anti-immigrant policies. However, Hawkings conceded that Trump will likely continue to appease his base rather than adopt evidence based policies. Solving the climate crisis demands that we work together and Trump appears to be doing just the opposite. "[W]e only have one planet, and we need to work together to protect it," Hawkings wrote. "To do that, we need to break down, not build up, barriers within and between nations." Durwood Zaelke, the founder and President of the Institute for Governance & Sustainable Development (IGSD), told Futurism that Hawkings is "spot on". "We’re chasing a fast-moving—indeed an accelerating problem of climate change, with slow-moving solutions, and we’re getting further behind every day," Zaelke said. "[W]e’ll soon face climate-driven chaos that will threaten our very civilization and our democratic form of government, while the fear of chaos feeds authoritarian regimes." Just before his death, Hawkings developed mathematical proofs for the multiverse. He also suggested that the universe is finite and darkness will ultimately bring it to an end as stars run out of hydrogen fuel. He hypothesized that small amounts of warming may be a common factor in both the death of our planet and the end of the universe. While runaway global warming may end life on Earth, the universe may succumb to what is called "heat death". According to this view the universe will go dark as it warms ever so slightly to reach temperatures just a fraction of a degree above absolute zero. A private funeral will be held for Hawkings at St. Mary's Church on March 31 and his ashes will be interred in the grave next to Sir Isaac Newton and close to Charles Darwin at Westminster Abbey.